Edward Scissorhands premiered in 2005 but this is the first time it has been to Liverpool. Choreographer Matthew Bourne, famous for his all-male Swan Lake, recently brought Lord of the Flies to our city to great acclaim. His latest exposition of wonderful dance-theatre, a re-imagined production that started touring last year, also wowed the punters. That it took seven years for Bourne to obtain the rights is testament to his vow to produce new work that has great stories and passion. This is a tale of a lonely outsider, Edward, the unfinished boy with scissors for hands, who is taken in by the Boggs family in Hope Springs, a surburban American town. Set in the 50s, with an emotive score by Danny Elfman and Terry Davies, this gothic modern fairy tale, devised from Tim Burton’s 1990 film, sees Edward sidelined, gawped at and ultimately accepted, until that is, young Kim Boggs (Ashley Straw) falls in love with him, much to the chagrin of her, preppy boyfriend Jim Upton (Tom Clark). 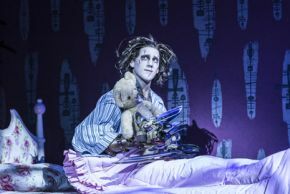 Edward (superbly danced by Dominic North), the naïve creation of an inventor,soon learns to live with pathos and misunderstanding. Gradually he starts mimicking those around him, who use him to their own ends. To the backdrop of a Stepford town, the neat and inventive choreography often amuses and is sometimes a bit on the cheeky side. We have the wonderful femme fatale Mrs Monroe (the superb Madeleine Brennan ) who seduces Edward whilst her husband is outside fighting the lawnmower in a cartoonish laugh-out-loud scene. There is a lot going on on stage and the effect is of a colourful, magical world where Edward is ever present. The costumes are 50s style with wide skirts and ‘Grease’ style clothes for the kids. We have the stuck up Upton family canvassing for votes, the creepy religious Evercreech’s with their holier- than -though attitude and non-compassion, and the Grubbs who love their slovenly ways. There’s delicious dancing from young sweet Ashley Straw, and many brilliant ensemble scenes, but at the centre of this tale is the wonderful, strange figure of Edward Scissorhands. North (who alternates with Liam Mower) was assured and emotional in what is a very physical part. How he managed with fists full of sheers is a wonder. This is a lush and fantastical production with many fascinating characters, but it is North who is given the loudest and longest cheers at curtain call, and every step is well deserved.